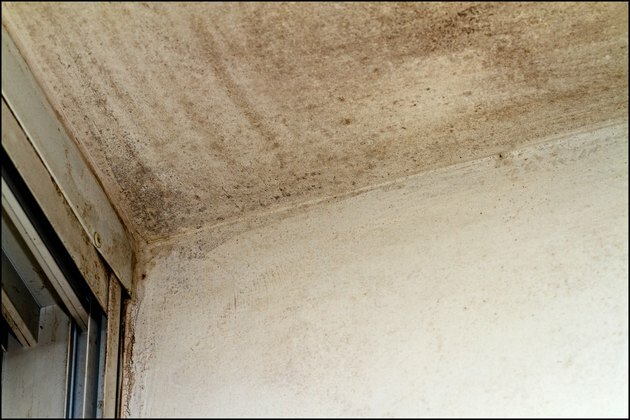 Mold and fungus are often found in buildings, including homes. Some strains of mold are harmless and have little effect on health, but some can have very serious effects. Even if the mold and fungus is not visible, spores are released into the air that can have negative effects on your health. According to the website Health and Energy, mold and fungus growing inside the home can cause or aggravate illnesses including asthma, allergies and chronic sinusitis. If you have an extensive mold problem, you may need to hire professionals to remove it, but you can often treat localized instances of mold and fungus by yourself. Locate and eliminate the source of the moisture. According to the U.S. Environmental Protection Agency, all mold and fungus needs a source of moisture to grow. In houses, this source of moisture is most often a leak or crack in the walls or flooring. Bathrooms, kitchens and basements are common locations for mold and fungus to grow. Patch up any cracks that you can find, and allow patching material to dry. Place a face mask, such as the type for painters sold at home supply stores, over your nose and mouth. This is especially important if you have allergies or asthma, because direct exposure to the mold and fungus will cause you to inhale mold spores. Scrub the affected area with a scrub brush and soapy water. Allow the area to dry, and see whether the problem is fixed. It is often necessary to repeat this process. Repeat the cleaning process as many times as necessary until all mold is removed. Follow by cleaning the area with bleach and water to disinfect. Allow the affected area to dry. Repeat the cleaning and disinfecting process on all areas that have mold. If you have an extensive mold problem that will require professional cleanup, check with your home insurance provider to see whether the costs are covered by your policy. If you suspect mold is in the air ducts of your home, do not run your heating or cooling system until it is fixed. This type of remediation should be performed by a professional.